Hawai’i is famous for its warm tropical waters and extremely diverse marine life. The waters around the Big Island are teeming with tropical fish of every size and color, and snorkeling is the perfect way to explore this beautiful underwater world. 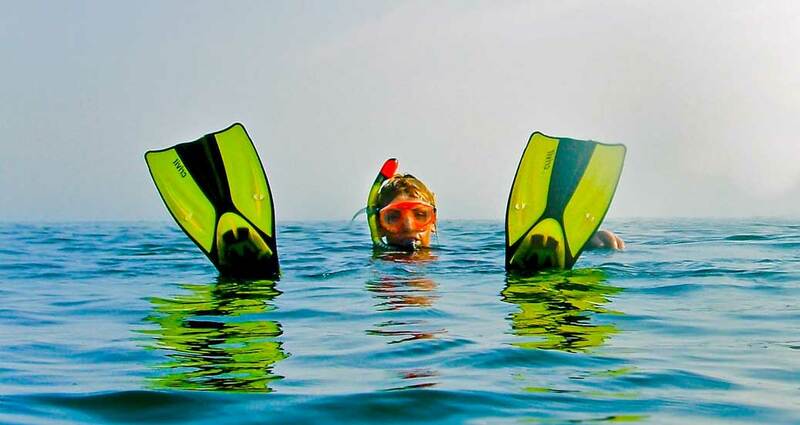 Snorkeling is an activity that can be enjoyed by people of all ages and abilities. Snorkeling gear is easy to carry along and cheap to rent and is an ‘essential’ addition to your sunscreen and towels to take to the beach (map of big island beaches). And the best thing? there is very little to learn. If you are snorkeling for the first time you will need a little bit of practice to get used to breathing through your snorkel, but that is all there is to it! Yellow tang is one of the most common and easily recognized fish in Hawaiian reefs. You can see them on nearly every dive, both individually, in small groups, and in large schools. This photo was taken in Kona bay, in front of Ali’i drive in Kailua Kona. Where can you find the Fish? If your main goal in snorkeling is to see many fish keep in mind the following: fish need shelter and food, so the best place to look for them is near coral and the rocks. If you are entering the water somewhere where there are only rocks, be careful not to step on coral or sea urchins. A sandy strip is the best place to get into the water. A group of snorkelers observing undersea wildlife. We think that if you put on your snorkeling gear and start swimming, you [a] will never get bored, but [b] will be busy for a long, long time. Because you probably do not have the luxury of time, we have selected three of the best snorkeling spots on the Big Island. We recommend the following because of their abundance of marine life and easy accessibility. 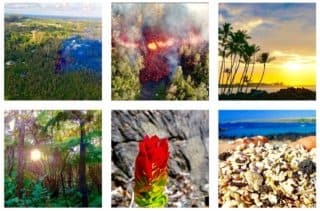 For a more extensive description of these spots, including hints and directions, read our article on the best snorkeling spots on the Big Island! Kahalu’u Beach Park: Kahalu’u Beach is also famous for it’s Honu, or sea turtles. On any given day you’ll be able to see quite a few of them feeding on seaweed and sunning themselves on the warm rocks. If you are staying in Kona, its proximity makes the beach park an ideal place for last minute snorkeling. Getting there and back plus an hour of leisure snorkeling will only cost you two hours! Kealakekua Bay: Kealakekua, also known as “Captain Cook”, is an underwater marine sanctuary with dolphins and sea turtles. To get to the best spot, you need to take a long hike or rent a kayak. If you are not into kayaking yourself, you can find many snorkeling boat tours in Kona to visit this secluded sanctuary. Honaunau Bay – the City of Refuge: The Travel Channel named Honaunau Bay one of “America’s Best Beaches 2004”. A big reason for this is that due to a very advantageous layout of the bay, the water is almost always calm and the waters have exceptional visibility most of the year. The Kona (west) side of the Big Island definitely wins the prize for best snorkeling coast of the Big Island. The calm waters and many beaches offer snorkeling spots that are superior to those on the Hilo side. Our 3 favorite Big Island spots are on the Kona side, but there are many more. As a matter of fact, there are so many good spots to go snorkeling close to Kona that we have created a separate list! Click through to read our list of 14 good snorkeling spots on the Kona coast. There are not that many good snorkeling spots on the east (Hilo) side of the Big Island. The reasons for this is that the water conditions on this side of the Big Island are often rougher. This means that there are fewer beaches and that the visibility in the water is often not good. Richardsons Ocean Park is sheltered from the surf and includes a small black sand beach and some tide pools. The water here is shallow and calm, and turtles are a common sight. Richardsons is hands down the best snorkeling spot close to Hilo. What does it cost to buy or rent a snorkel set? If you are planning to use your snorkeling gear at least a couple of times, it might be worthwhile to buy a cheap snorkeling set at the local supermarket. You can get them as cheap as $20 to $30 for a complete set. Buying has the big advantage that you don’t have to return your rental gear at the end of the day. The quality and ease of use of the cheapest snorkel sets probably won’t be as good as the gear available for rent. Snorkeling gear can be rented cheaply around the Island. Expect to pay between $5-10 a day for a full kit, and between $25-40 for a week. If you are renting in Kona, Snorkel Bob has some good deals. If you are not confident you can find all the best snorkeling spots on your own, or just don’t want to invest the little time you have on the Big Island into renting gear and taking care of everything yourself, you can choose for a snorkeling tour. Snorkeling tours typically last 3 to 6 hours and use a boat to take you to some favorite snorkeling spots. Snorkeling gear, food and drinks, and entertainment are often taken care of. We are always happy with the tours offered by Body Glove (operating from Kona) and by Sea Paradise (operating from the Keauhou harbor south of Kona).. If you are looking to take a snorkeling tour with a larger group (about 6+ people) it is worth considering chartering a boat for yourself. This will give you a private boat for your group and full control of your day at a price comparable to those for the ‘larger’ vessels. Have a look at the Paradise Sailing Hawaii website (Kona) if you are interested in chartering a private sailing boat. The ocean is Hawaii’s most important resource, and it has an incredibly fragile and diverse population. More than a quarter of the sea life here is found nowhere else on the planet. It is important for everyone – locals and visitors – to practice an ancient Hawaiian tradition: Malama kai. Loosely translated it means “take care of the ocean”. The video features local fish (most prominently the Humuhumunukunukuapuaʻa) that tell the do’s and do not’s of conservation with a Hawaiian dialect against a background of original music and chants. It is narrated by some of Hawaii’s top entertainers. Finally, please remember to be respectful towards the ocean and its inhabitants. Marine mammals are protected and should not be fed or actively approached by boats or swimmers. Be prepared. Use high-quality snorkel gear. Fins, mask, de-fogger and sunscreen are a good start. A fish ID card finishes of your gear nicely. Booties to protect your feet sometimes also come in handy. Be careful: Never snorkel in (unsafe) high surf conditions. If you are a beginner, start in shallow water and only venture further out when you feel comfortable. As soon as you start feeling anxious, return to the coast. 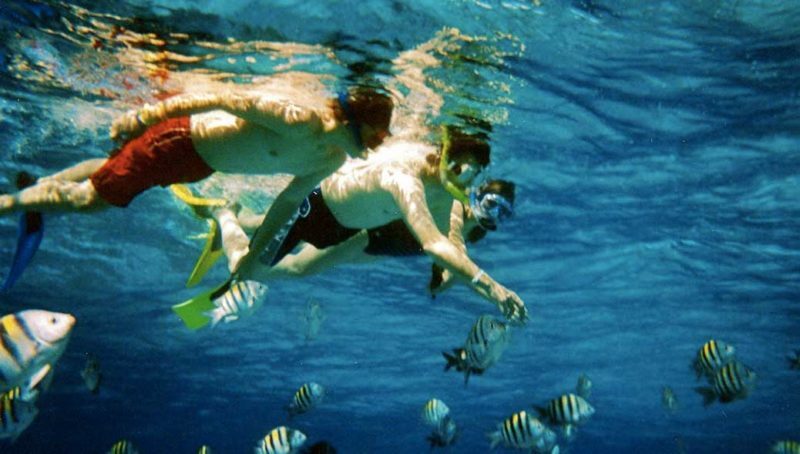 Always snorkel with a buddy: Snorkeling with a companion is more fun and much safer. In the event of an emergency, your snorkel partner could get help and save your life. Use your gear properly: Ask the personnel at the rental shop if there is anything you need to know about the gear, be sure to ask how to clear your mask under water (generally: while floating with your feet down and your face up: exhale a burst of air through your mouth to blow the water out). Time your snorkeling properly: The best time to snorkel or dive is generally in the morning. Water conditions are most clear and the fish are more active. Be respectful and have fun: The reef is a living animal! It may look like plants and rocks, but in reality, it is made up out of millions of tiny animals. Only rest on the sandy bottom or bare lava.